What software should I use to capture drawing tablet, voice, and slides for creating Sal Khan style YouTube clips? I’m right at the beginning of this learning curve and process, but basically I need to become an online training and especially video production business. This is one of the essential changes I need to make to my education business model in order to survive. To do this I need screen capture software. I’m not sure what Sal Khan uses. I could probably find out. But I think he’s on a Windows computer and I’m now on a Mac so it’s likely to be different in any case. I’m not a graphic designer or a video guy by background, but I’ve started using Camtasia and it seems intuitive and does what I want for now. Here’s a screen shot below. But don’t be scared off. It looks a lot more complicated than it actually is. What I’m working on below is a screen capture of the slides that I use to teach the National Certificate in Adult Literacy and Numeracy Education (Vocational). At the bottom of the shot you can see where my voice is recorded. That’s pretty much all I need. I can export directly to Youtube from Camtasia. What screen capture software do you use? 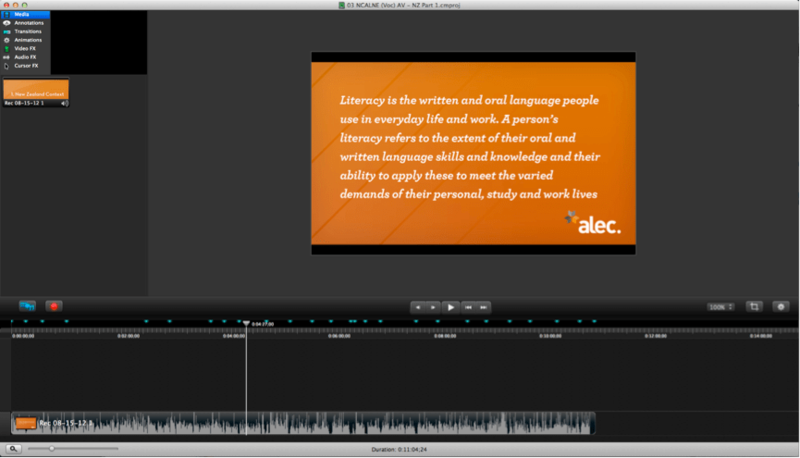 What do you think of Camtasia 2? Let me know in the comments. Prev Which microphone does Sal Kahn use? Next What does the TEC’s Adult Literacy and Numeracy Implementation Strategy 2012 mean for NCALNE (Voc) professional development?